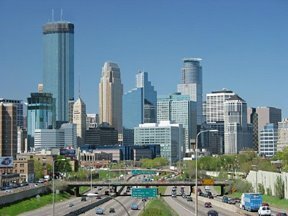 Here’s a nice little plug for I-GO by a transplanted-Chicagoan blogging in Minneapolis. Maybe she can avail herself of Hour Car, a St. Paul-based car-sharing service that’s remarkably similar to I-GO’s business model. They were also launched by a non-profit green org, Neighborhood Energy Connections, that, like I-GO’s parent org Center for Neighborhood Technology (man, even the names sound alike), is invested in energy conservation initiatives and policy work. One of Hour Car’s staff stopped by our Wicker Park office this week since he was visiting Chicago. Smart guy. They’ve got two full-time staffers and are growing their biz and fleet steadily. They’re also focused on low-emission vehicles. Hour Car publishes a blog, too, and posted an item on I-GO yesterday. And FYI to all I-GO members: If you’re visiting the Twin Cities, you can use Hour Car’s fleet without having to pay a membership sign-up fee. That benefit also applies to our non-profit car-sharing sister companies in Philadelphia (PhillyCarShare) and San Francisco (City CarShare). Tell ’em I-GO sent you. You are currently browsing the archives for the car share category.